Past perfect future tense | hear.here. Last weekend, we went up to Merrillville (again) to see Dennis DeYoung in concert (again). This was the 40th anniversary of the Styx album “The Grand Illusion”, which because I’m forty*mumble* years old, I remember the album very well. My record got worn out in my childhood. The first half of the show, he played the entire album without stopping. So some of the songs, I had never heard live before in any iteration of the band. When he got to the third song, “Superstars”, I knew it was coming, I knew what it sounded like, and yet I had a moment at the beginning of it where all my brain heard was mush until that auditory memory kicked in and said “stop it, you know what this sounds like” – I may have actually said that consciously and probably out loud. Then I heard it, as clear as listening to it in my bedroom in South Dakota on my ancient record player in the 80s. My brain remembered, and although the lead voice was different and the live version was of course different, the memory was enough for me to recognize what I was hearing, but then my actual new hearing kicked in and was able to hear the new things – that August Zadra’s voice may sound a lot like Tommy Shaw’s, but that it isn’t the same. I suddenly wasn’t just hearing the record in my head but was hearing what was actually being played, and hearing it clearly. My husband will roll his eyes at this, because he’s heard A-ha’s “Take On Me” in various forms countless times in the last few months, but I could write a dissertation on all of the musical variances I’m hearing between all the different versions – from their very first demo in the early 80s to the acoustic studio version released earlier this month. I get excited every time I hear something new in it, which is almost every listen. Of course my brain remembers the song. I’m pretty sure I had the tape in the 80s, or my brother did, and since I watched MTV every waking hour of the day, I could probably draw the video in my sleep. But what does my brain really remember of the song? It has been an interesting exercise in auditory memory. So what am I hearing when I listen to “Take On Me” over and over? I’m hearing the subtle and amazing control of an astounding voice, a hidden bass counterpoint to the famous keyboard riff, a driving guitar under the verse, lyrics that are both melancholy and inspirational at the same time. I can distinguish instruments, even the different types of keyboard being played. Going back to the first version in 1982 (then titled “Lesson One”), I hear youth, hope, determination, and a lack of polish. Moving to this year’s live unplugged version, I hear polished perfection and control, maturity, and 35 more years of life experience. Every version in between has something unique and different than the others – things I wouldn’t have noticed if I had not gone through this hearing journey. I hear more than just the music itself, I’m starting to hear the magic that happens when brilliant musicians play off each other so well. All of this has led me down a rabbit hole of new/old music. 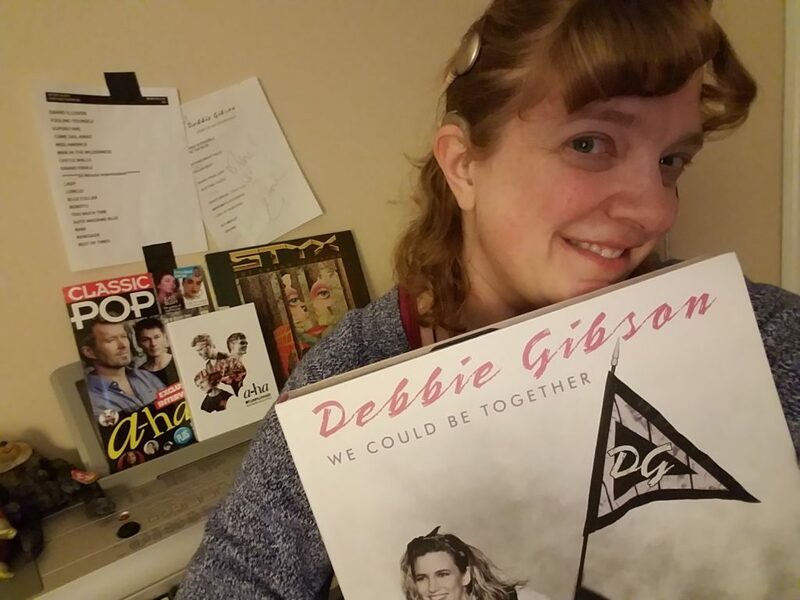 Between Debbie Gibson’s new box set, with things I haven’t heard before, things I haven’t listened to since before I lost my hearing, and things I’ve only known as a deaf person, and revisiting my old Styx records, I am finding all sorts of joy in rediscovering the old and allowing the auditory memory to thrive – like Deb’s “Deep Down”, the song I initially tweeted about, I remember listening to on my Walkman and thinking how cool it was that there were two vocal channels, one on each side. Listening to that in only one ear with poor hearing was painful to me because I remembered what it was supposed to sound like. I wanted to cry because it was never going to sound that way to me again. But now? No, it doesn’t sound like I remember it. It doesn’t sound natural, it has that tinny digital sound that any artificial hearing is going to have. But you know what? I think it actually sounds better than I remember. In terms of the new, I embraced the A-ha unplugged album and took it further and started listening to their entire back-catalog. Which is HUGE and I think most Americans, myself included, really got shafted when MTV stopped playing them, because there is some amazing stuff in there. I’ve been listening to them for only a few months and am still discovering wonderful things. I’m just so thrilled to be able to listen to something that is completely new to me and not only understand it, but really hear it, and really feel and be moved by it. What I experienced a few months ago of finally hearing something new that really moved me has just continued to grow and my hearing gets better and better every day still with every new song I listen to – more than a year after my activation. My choice of new music today that inspired this post is rather fitting. I’m listening to Magne Furuholmen (A-ha’s keyboardist)’s album “Past Perfect Future Tense” (which I highly recommend checking out). It could quite literally be the story of my hearing, going from “I understand the words, they just make no sense” to “I know these words, they just make no sense” to finally “I hear you now, it makes much more sense”. Hi Ali, my name isTina gonzalez, i am a deb fan myself since 87. and i was wondering if u had an email address where i can talk with you privately? i want to ask you a huge favor. mine is mamatina26@aol.com if you just want to email me and then i can reply to you.